Valerie Tarico is on a five month trek through the southern hemisphere with her husband and two daughters. Missives from the Southern Cross are her occasional dispatches from the road. We have arrived in Periyar, a national park in the Western Ghats, the low mountains that run along the south of India, dividing Tamil Nadu from Kerala and I am sitting on a sturdy balcony looking out at mist and trees through a cast iron railing. Birds call from all directions; a bell sounds in the distance. Yesterday, we spent three hours walking in the park—a dry tropical forest that is home to giant squirrels, lemurs, buffalo, a herd of a thousand elephants, forty tigers. The reserve centers around Lake Periyar, and by luck we have arrived during frog time, a few precious days when young frogs leave their watery birthplace and set off for the forest where they will spend the rest of the year. The lake in this dry season has shrunk to a muddy trough, and a grassy slope that will be submerged during the monsoons is now dotted with little hoppers, all making their way for reasons they cannot understand to the dark line of trees, while the wild boars glut themselves on mother frog’s curious bounty. Here in this park we see for the first time a remnant of India’s ancient forests. A strangler fig that will grow to be one of the forest giants wraps itself around a sturdy teak that eventually, choked to death, will be nothing but a hollow in the center of the ficus. Lianas compete for light, and green orchids sit in the hollows of deciduous trees, now dormant. The haphazard tangle reminds me that the other forests we have in Tamil Nadu have been human creations—plantations of trees that suit the human eye or purpose. Plants, animals, hillsides, seascapes, city or countryside—all of India, save small patches like this one, is a mosaic of human activity at its ugliest and most beautiful and most ordinary. Between the Indian Ocean and the Bay of Bengal, a billion members of our species dot the continent like those frogs between the lake and forest edge. But we humans do not simply dot the landscape for three days per year. We dot it 365. It is ours. Before arriving at this park we visited another mountain retreat in the Western Ghats, Kodaikanal –a “hill station” developed by American missionaries to escape the oppressive heat of the lowlands. Despite the denuded hillsides visible from lookout points, the area close in around Kodaikanal is lush and green. It too, centers on a lake—though a much smaller one. I found it lovely—a refreshing change from the press of humanity on the flatlands. But I wondered while we were there if most species would experience it as an oasis, like I do, or as a human-created wasteland, like much of the subcontinent. The trees that form Kodai’s forests are largely gum –Eucalyptus—Australian imports. Around the world, people in warm climates reforest with gum trees because they grow so fast. In my privileged life of backpack travelling, I have seen them in rows that stretch for kilometers in the north of Spain, and on the Ecuadorian altiplano, and lining roads in Fiji, and in groves outside of Burmese villages. Gum trees provide firewood and construction wood, and in Kodai, eucalyptus is the basis for a cottage industry in aromatic oils. But the same oil that makes eucalyptus smell so good to us makes a eucalyptus forest a desert to most animals and other plants. The oil is a defense. It makes the leaves inedible. When they fall to the ground, they don’t decompose into a fertile mulch but rather prevent the growth of understory plants. Several years ago in Myanmar, my family spent a day hiking to a tribal village. On one side of the path lay indigenous forest; on the other eucalyptus. Our guide told us that the indigenous forest sustained over 200 species of birds (as does Periyar); the eucalyptus sustained ten. We humans see the world through such a human filter. We do not want to eat tree leaves. We do not care if there are mushrooms and vines and small seed-bearing plants and nesting materials on the forest floor, as long as we have wood for our shelters and fires. To most of us, a tree is a tree. Only the rigorous training of a biologist or the equally rigorous discipline of a mystic can push us outside the human scale and into the perspective of a leaf cutter ant or an elephant. Our normal view of the world is like a human-sized pencil drawing of a reality that is nuanced and intricate on scales beyond our grasp. And because we cannot see the world in its intricate complexity we cannot know what is lost when in our 365 days per year dotting the landscape from sea to shining sea, we change it. The gods we create are as two dimensional as “re-forested” forests: two dimensional, reduced to a few simple ideas that we can grasp, defined by the qualities that we ourselves value and fear most. Christian-Hindu-Muslim. . . . The gods are capricious and cruel, or merciful and generous. They love us like our parents did, only more. They suckle us and carry us when the way is rough. They are as abusive as tyrants with unfettered power. They get angry; they save us from themselves. They are petulant and need homage. They are sexist and hate contamination. They are magical servants that hear our every wish—especially if we offer them gifts or sacrifices. If our culture values hierarchy, they are kings and queens; if it values casual equality, they are buddies with whom we can have personal relationships; if it is a culture of egoists, they are both. But always they are human, for we are capable of no more. And yet the religions that spring up around them are complex real world systems of morality, ritual, lifestyle, and group dynamics, not perhaps as complex as a forest ecosystem, but close. Scholars who see religion as adaptive may argue that each religion evolved to optimize group survival under specific conditions of ecology (e.g. desert), technology (e.g. bronze age), human population, and competing ideologies—and optimally each continues to evolve so as to serve the human survival of its human hosts under changing conditions. Some writers have pointed out that animism seems to have arisen among hunter-gatherers, fertility-goddess religions coincide with farming, and competitive male gods took prominence among herdsmen. In this way of thinking, a religion takes a certain shape because that shape is useful in a specific environment. If so, does that mean they are more or less life supporting, depending on environmental fit? Maybe religions are, in a sense, like native forests, and re-forests. I don’t know enough about history or sociology to speculate how Hinduism’s layers of place-centered, sensual, and fierce avatars have emerged, but I look at Hinduism as it is practiced now, here in its birthplace, and I think that it is more like a tangle of wild, native trees than a plantation of gum trees. How about religions that are not native to this continent, like Islam and Christianity. Are they more like gum trees? In this environment do they support life less well? Christianity is older in India than it is in most of Europe. Tradition teaches that Christianity was brought to India by the Apostle Thomas around 50 C.E. Scholars think, more likely, that it was introduced by a Syrian merchant named Thomas in the 4th Century. Eastern Orthodox churches still exist today, some with services in Armenian. Vasco de Gama, a Portuguese explorer, landed on the West Coast in 1498, bringing trade, and Roman Catholic missionaries –Franciscans, Jesuits, and Dominicans. These European missionaries worked to convert not only Hindus, but also Orthodox Christians, and when the conversion rate wasn’t to their satisfaction, they brought to Goa the Inquisition. Over the course of two hundred years, thousands of Indians died at the stake. Hinduism at its most abstract teaches that God is too big to be contained in any single avatar or set of sacred texts; at its most concrete, it teaches that there are many gods. Either way, it allows for many paths and competing truth claims. Christianity, by contrast, makes truth claims that are exclusive; it insists that God has one face (or two or three, depending on how you define them). These exclusive truth claims mean that to “succeed” Christianity needs to replace other religions, not simply to be incorporated within them as one more face of Divinity. Medieval missionaries and inquisitors believed this need was serious enough to die and kill for. But, Christianity evolves. Religions, like animals and plants and micro-organisms, have many reproductive strategies. Christianity, from a reproductive standpoint, is more like influenza than polio. What I mean is that it is constantly mutating, its “DNA” combining and recombining so that it can adapt to different combinations of culture and technology—so much so that Christianity may be better thought of as a family of religions rather than a single spiritual practice. Big box churches selling prosperity gospel, for example, are American variants of Christianity. Amish beliefs and practice have their own cultural and technological matrix, without which they cannot survive. Today, India’s Catholics live in relative peace with their Hindu counterparts. They intermarry. Parochial schools educate students from all of India’s religions. At an ancient monument to Shiva, our Hindu guide said that he goes to temple during the week and to church with his wife on Sunday. In the north, below Darjeeling, I visited a colonial era mission where Canadian Jesuits who looked as old as the buildings were teaching Buddhist and Muslim (and Christian) children the three R’s and teaching the local farmers organic pest control and cheese making and how to get methane from cow poop. Enter the Americans, with their more recently mutated variants of Christianity and brash certainty that what’s good in Texas is good in Trivandrum. Letting Buddhist kids graduate from their schools still Buddhist or Hindu kids graduate Hindu would be a failure. They do everything in their power to make sure it doesn’t happen. I spoke a few years back at a conference of Hindus who were concerned about Christian proselytizing. The stories they repeated may have been apocryphal, but they included the tale of a Christian school bus driver who pretended the bus wouldn’t start, had the kids pray to Shiva (no response) and then twisted the wires together when they prayed to Jesus. They included the tale of a village where missionaries drilled a well that only converts were allowed to use. They included the more painful story of two Hindu girls who were burned as witches by a mob of recent converts. (Some Pentecostal missionaries tell converts that the Hindu gods do actually exist; they are demons.) Mostly though they talked about more mundane griefs: communities divided, neighbors now on opposite sides of the exclusive truth divide who no longer talked to each other, family members who no longer paid each other visits. 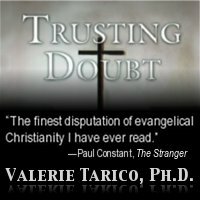 In the first edition of my book, The Dark Side, soon to be republished as Trusting Doubt, I mention an Air India flight on which I overheard an eager young American missionary speculating about whether he would be willing to die for Christ if the Indians he was missionizing became aggressive. I rolled my eyes. The kid had obviously been reading Elizabeth Elliot books in preparation for his trip rather than reading histories of India. But in reality, some of the relentless proselytizing has provoked violent reactions. Some Hindus, despite the history of relative tolerance, are radicalized. The incidents have been isolated, but as we are reminded by the horrendous Muslim-Hindu riots in Gujarat in 19)), any sectarian divide can provide a flashpoint for brutality when conditions are right or, better said, when conditions are wrong. Consider another example, simpler and more mundane. Christians and Muslims are meat eaters. Both of their religions emerged in a harsh desert environment in which dry grasses offered little of sustenance to our species, except when their nutrients were processed and condensed in the bodies of herbivores. Hindu India is largely vegetarian. Pulses (beans, lentils etc) and rice provide energy for daily living, and cows who turn grass into milk protein and fibrous cooking fuel are venerated and protected. Most restaurant signs let you know if the food they serve is veg, non-veg or both. We now know that in climates amenable to farming eating lower down the food chain means that less land feeds more people. If some people eat meat, more people don’t eat. A lot of poor people in India eat because a lot of rich people eat spicy, elaborate dishes made of beans, rice and vegetables rather than meat. Historically, for the highest castes, the food restrictions were particularly rigorous. What happens to this equation when a non-native, meat-eating religion is planted? As of the latest census, India has over a billion people (censusindia.net). Currently 2.3% are Christian, which means 23 million Christians. American evangelicals are pumping money and missionaries into the country in an effort to increase their market share, and they selectively target Hindus for conversion because that is safer and easier than targeting Muslims. What happens to food distribution if they are successful in doubling the number of Jesus worshipers? What if, additionally, the Evangelicals bring with them the resurgent strategy of Christian competitive breeding (bing “quiverfull movement” or “complementarianism”), which is already encouraged by Rome for India’s Catholics? The American missionaries look at Hinduism, Jainism, Islam, and Catholicism they way that most humans look at forests. A forest is a forest, a bunch of trees, not an intricate ecosystem in which organisms play out their parts in fine and precarious balance. Evangelicals care whether a religion is right or wrong about the world to come. (Theirs is right; the others are wrong.) But beyond that, a religion is a religion is a religion–not an intricate system of roles and moral priorities that evolved from and for a specific context. They think that they can replace India’s tapestry of religion with a monoculture of Evangelicalism, a package of Four Spiritual Laws and translated hymns, and the world will be a better off. As a nonbeliever, I incline toward replacing the tapestry with rationalism, with realism, with freedom from superstition and (especially) from religiously prescribed gender oppression. But what if we both are wrong? What if religions really are evolved adaptations? What if, furthermore, lasting, healthy religious change needs to be evolutionary rather than revolutionary? Karl Marx thought that we could take a different set of complex evolved social systems–economic systems–and replace them with a simple ideology that fit in a book. So did the Chicago school of free market idealists who followed their guru Milton Freeman (the anti-Marx), gained power under George W. Bush, and precipitated a global recession. What does this have to do with India and imported gods? The superficial linkage is that the Communist Party actually won elections in the Indian state of Kerala and that Maoist rebellions continue to break out in the north. The next deeper parallel, is that Communism in the 20th Century functioned essentially as a secular religion, with inerrant sacred texts, patriarchs and saints beyond reproach, a formal iconography and a promised heaven. The founders became god-men, like the Prophet Mohammed or Father Abraham or Buddha, with the same human flaws that characterized these other superhumans. But here is why Marx and Freeman come into my musings about gods and gum trees: I suspect that ideologically-based economic systems do harm because they are cartoons, two dimensional graphic novels that both the authors and their devotees mistake for four dimensional schematics of the real world. Ideologies like theirs arise in response to specific histories and social conditions, just as a tree evolves to fit a specific niche. But then they get taken out of that context and treated as if their relevance was universal, as if this one fragment of an insider argument were actually some universal (catholic) Truth. Do you hear the connection? All of a sudden I could be talking about Jesus, or Mohammed, or Buddha. Perhaps, more often than we realize, priests, reformers, saints and even our most cherished god-men, offer us man-made forests of gum trees, when what we need is real forests.